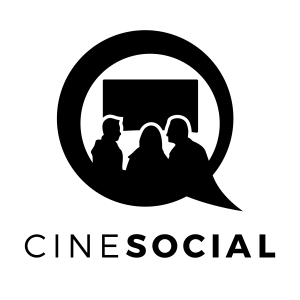 Esther Blodgett (Janet Gaynor) is a humble farm girl from North Dakota with big dreams – she wants to become a movie star like the idols she worships during regular trips to the cinema. Funded by her kindly Granny (May Robson), she travels to Hollywood to try her hand at film acting. After months of waiting, Esther finally lands a role…serving hors d’oeuvres at a party. 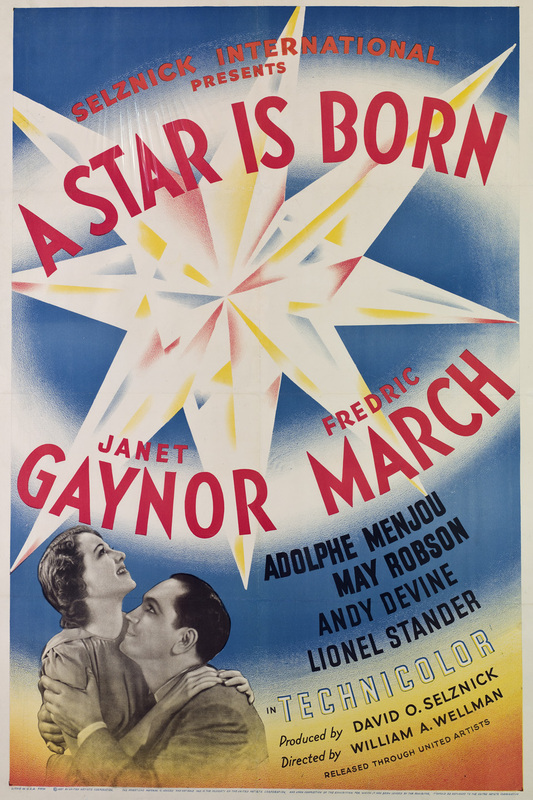 Here, she meets matinee star Norman Maine (Fredric March) and the two fall in love. With Norman’s help, Esther gets acting roles in movies and changes her name to Vicki Lester. But Norman’s alcoholic binges threaten their love…and her long nurtured career. Although not quite the great-grandfather of the series of ‘Star on the wane helps star on the up’ films (in the sound era anyway. George Cukor’s What Price Hollywood covered similar ground in 1932), this original star was born from the fine scripting of a talented trio that included noted wit and Algonquin Round Table* regular Dorothy Parker. Writing and words were Parker’s passion and it book-ends the movie: we open and close with a script serving as explanatory title cards. “Don’t let anyone break your heart. Go out there and do it yourself – that’s your right!” Granny relents and then gifts Esther the bus fare to L.A.
“He fights as well as he can act!” Lionel Stander’s rasping, reptilian Press Agent villain sums up Norman after a bar-room punch up. Although she later dismissed the writing as retaining little of her hand the wise-cracking, sarcastic, pessimistic view of the “Metropolis of make-believe” is pure Parker. (NB: When Gaynor alights in La La Land, we cut to the front of a bus, a train and plane as ‘Los Angeles Bound’. In this neat visual, we are told that many more people are headed for the same town and with the same purpose as Esther). 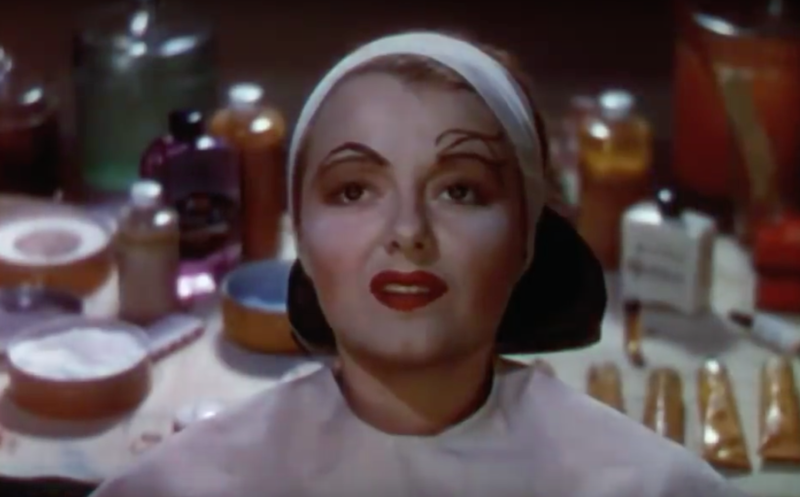 Maybe she’s born with it…Vicki/Esther (Janet Gaynor) undergoes the Max Factor treatment in A Star is Born (1937). Gaynor is little known to modern movie audiences, but to those with cinema history in their DNA her importance as a star and performer of note is not diminished. She was, after all, the first recipient of the Best Actress Oscar, back in the days when the award was granted based on one’s total body of work for a year, rather than one individual film. Her personality was indelibly that of the sweet, wholesome, perky girl-next-door who suffered the travails of a post-Depression era America with courage, fortitude and a wide, Colgate smile. This film, one of her last (she retired from the screen the next year, returning for one last hurrah in 1950), is one of her best. During the waitressing scene, she displays admirable mimicry as she impersonates Greta Garbo, Katherine Hepburn and Mae West. Her altruistic wife with a lilting, songbird voice, prepared to wreck her nascent Hollywood career to save her wreck-head husband, makes her Esther/Vicki one of the sweetest and purest of movie women. Norman’s alcoholism is initially presented as a joke (we see him tucking a bottle of champagne into bed at one point, before jumping in with it, literally bedding his one true love). After leaving rehab, the first place he heads for is the bar, but not for alcohol. In an act of self-punishment, he opts for an unexciting ginger beer, with half empty glasses of the good stuff dotted around him, tantalisingly close. March, who himself was an Oscar winner (for Dr Jekyll and Mr Hyde, 1932), was a matinee idol like Maine, but one with bags of talent as an actor (he won his second Best Actor Oscar for The Best Years Of Our Lives, 1946). Here, he is multi-faceted and glibly entertaining. He is alternately confident, aggressive and flippant, then soulful and serious as he slips down the showbiz ladder. “I’m Mrs Norman Maine!” Norman (Fredric March) and Vicki/Esther (Janet Gaynor. The support cast (Devine’s whining Assistant Director pal of Vicki/Esther’s excepted) is swish and cool, from Stander’s prime display of panto baddiness to Menjou’s super-cool and loyal producer. As you would expect, this is a much more melodramatic and naive film than later versions, but with the whip-smart writing and believable, romantic lead pair, this has it in spades over its descendants. *A group of New York City writers, critics, actors, and wits, including Parker, who met for lunch at the Algonquin Hotel between 1919 and 1929. Through the newspaper columns of the members, their material was disseminated across the US. Writers: Dorothy Parker, Alan Campbell, Robert Carson. Janet Gaynor, Fredric March, Adolphe Menjou, May Robson, Andy Devine, Lionel Stander, Owen Moore, Peggy Wood, Elizabeth Jenns, Edgar Kennedy, J.C. Nugent, Guinn ‘Big Boy’ Williams.